ATLAS event displays and participants of the LHCP2018 conference. (Photos: Riccardo Serra/LHCP2018, Event displays: ATLAS Collaboration/CERN). Physicists from around the globe assembled last week at the Centre Domenico in Bologna, Italy, the site of Europe’s oldest university, to attend the sixth annual conference on Large Hadron Collider Physics (LHCP2018). The 425 participants enjoyed picturesque architecture, world-renowned cuisine, and a full menu of recent physics results from the LHC. A sample platter of a few of the tasty morsels is presented below, while a full listing of recent ATLAS results can be found here. The first session of the conference brought the excitement of a new measurement by the ATLAS and CMS experiments: the Higgs boson produced in association with top-quark pairs (ttH). Observation of this very rare decay provides direct evidence for the coupling of the Higgs boson with the top quark, thus verifying a key component of the Standard Model. The ATLAS result was particularly impressive, yielding a combined significance of 6.3 standard deviations over background, consistent with the theoretical prediction of 5.8 standard deviations. This antipasto was heavy enough to come accompanied by an ATLAS Press Statement describing the results. At 173 GeV, the top quark is too massive for the Higgs boson to decay to it as it does for the other quarks. This is what makes the measurement so challenging, but also what makes it an excellent test of the theoretical mechanism describing how fundamental particles attain their mass. Conference attendees continued on to the Primo course with more measurements of Higgs boson properties. Most notably, ATLAS presented a new measurement of the Higgs boson decaying to a pair of taus, the heaviest known lepton. 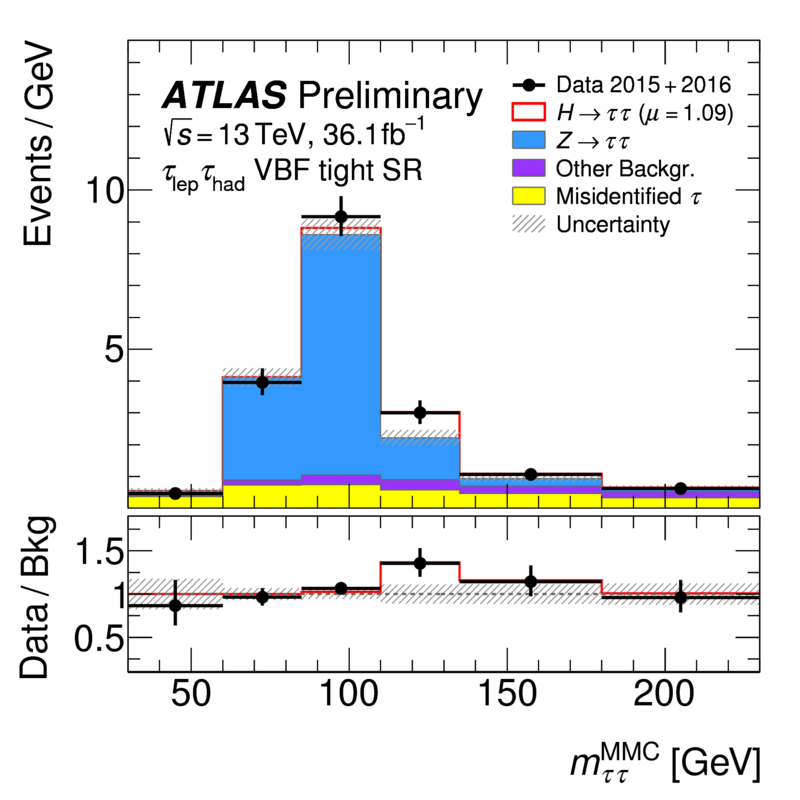 The ATLAS signal has a significance of 6.4 standard deviations, providing conclusive evidence of the decay and important information on how the Higgs boson interacts with massive leptons. The measured cross section of 3.70 picobarns, with an uncertainty of 28%, is consistent with Standard Model predictions, but the additional statistics expected by the end of Run 2 could push the limits of discovery. New methods added “sauce” to the analysis by helping to disentangle the gluon-gluon fusion and vector boson fusion Higgs production mechanisms, another important test of the Standard Model. The Secondo is typically the most filling part of the meal. Playing the roll at this year’s conference is the ATLAS search for new particles decaying to pairs of vector bosons. As in other decay measurements, the analysis looks at pairs of particles coming from the event collision, assumes they were produced by the decay of a new short-lived particle, then calculates the mass of that particle from their properties. A significant excess above expected background would indicate a discovery. The recipe in this case, however, is complicated by the fact that it looks for fast-moving vector bosons, which themselves decay hadronically. Moreover, many of the decays include the production of neutrinos, particles that leave no trace at all in the detector. So, rather than individual particles, each boson appears as a collimated jet composed of traces of energy in the calorimeter and tracks of charged particles in the inner detector. The expected two-pronged structure of a jet produced by a boson decay is difficult to measure, as the separation of the prongs is narrow, comparable to the granularity of the detector. However, new techniques that carefully combine information from the charged tracks with the calorimeter deposits have improved ATLAS’ ability to separate the flow of energy like independent strands of spaghetti. Although the ATLAS search did not find a significant deviation from the expected background, the new techniques will be employed in future searches for physics beyond the Standard Model. The conference featured an extensive menu of dessert items, from the tiramisu of Supersymmetry to the panna cotta of Higgs cross-section measurements and the cannoli of Heavy-ion physics. One could even taste a fruit salad of exotics, including searches for a W’ boson and the "Seesaw" heavy leptons that have been proposed to explain neutrino mass. Education and outreach featured prominently in this year’s conference. There was a dedicated parallel session on current activities, a plenary talk on remaining challenges and a public event featuring a talk by CERN Director-General Fabiola Gianotti in the Aula Magna di Santa Lucia, acting as the all-important Italian caffè to the meal. Of course, no great meal in Italy is complete without a shot of grappa, which was served on the last day, as talks focused on upgrade plans for the LHC and its experiments, as well as theoretical studies for future colliders. Optimism was prevalent throughout the entire LHCP meal, as the precision and discovery potential of many of the results presented were only limited by statistics. With the data-taking for 2018 – the last year of Run 2 – only just beginning, there is much room for improvement and many possibilities for new physics to be laid on our table.